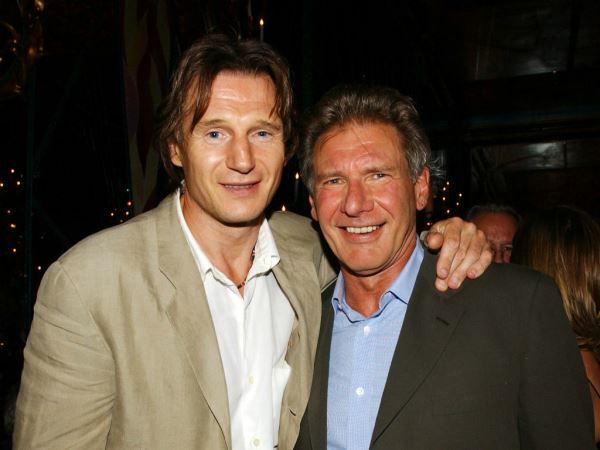 Liam Neeson thinks Harrison Ford is “the real deal”. The Taken actor spoke of his friend and former co-star after he was seriously injured in a plane crash on March 5. Harrison crash-landed his 1940s vintage aircraft on to a Californian golf course and was taken to hospital with a fractured pelvis and broken ankle. But Liam knows the 72-year-old will have done everything he could to avoid any further casualties. The 62-year-old Irish actor spoke to the outlet at the premiere of his latest movie, Run All Night. While he is seriously glad is friend will make a good recovery, he couldn’t help but joke about a present he was contemplating sending him. “I did want to present him with a badge that says ‘Ban Solo’” he laughed, referring to Harrison’s famous alter ego, Han Solo, in Star Wars. The two actors starred together in the 2002 submarine action film K-19: The Widowmaker. Hours after Liam’s well wishes, a preliminary report into the crash was filed by the National Transportation Safety Board. The document describes how the Indiana Jones star reported an engine failure shortly after taking off from Santa Monica Airport. The star then alerted air traffic controllers and turned back toward the airport, but as he did, the aircraft struck the top of a tall tree and crashed onto the golf course moments later.